Deep frying a turkey in hot oil is a delicious but surprisingly dangerous way to prepare your Thanksgiving feast. How can you deep fry without using scalding hot oil? While it's not possible to reproduce the flavor and texture of deep-fried food, one safer option is to roast a turkey at high temperatures inside a chamber, heated from the outside. Butterball's "fryer" is basically a small, electric oven that cooks a turkey at around 10 minutes a pound (two hours for a 12-pound turkey). While it can do that, it can't reproduce the flavor of a real deep fried turkey. You can add wood chips to get a little smoke flavor, though. Three years ago Char-Broil introduced the Big Easy Oil-less Infrared Turkey Fryer. A year later Masterbuilt introduced this smaller, electric version, basically a small electrically powered roasting oven. Calling it a fryer is a stretch since no oil is involved. 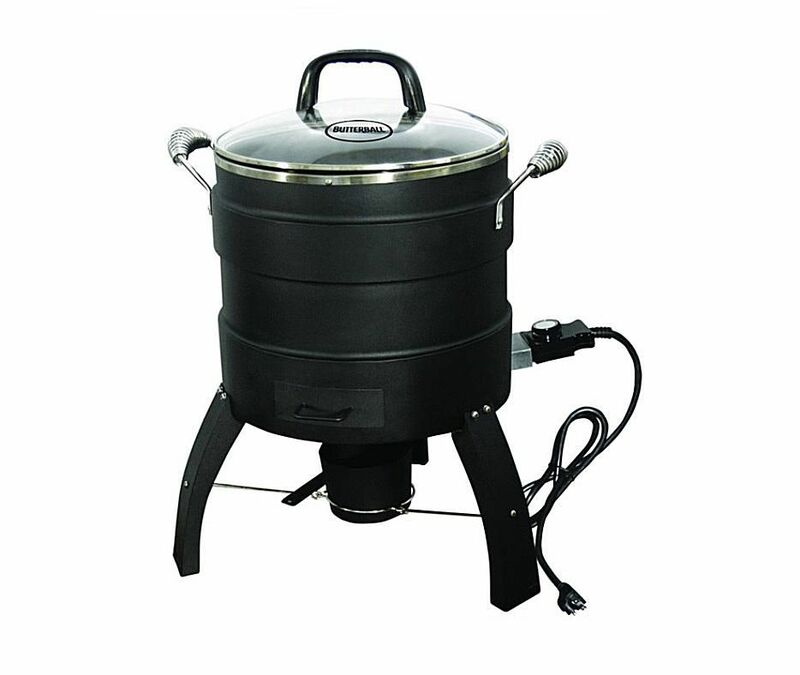 The Butterball Oil-Free Electric Turkey Fryer can be used to cook other things. Most obviously, it is good for chickens and other poultry. The removable "fry" basket can be used to hold a number of foods and the instruction manual includes a number of recipes for "fish on Rosemary," "roasted peach sundaes," and other creative items. The reality is that you are really broiling foods in a small roaster unit when you could just as easily cook them under the broiler in your oven or on the grill(preferably). The only real advantage this unit has over your oven or grill is that it is small and portable. As long as you can plug it in, you can take it anywhere. Should you buy the electric turkey fryer? Before choosing this item, be sure you know it can accommodate a large enough turkey for your holiday celebration. While the box says it can take a turkey of up to 18 pounds, the instructions recommend a turkey closer to 12 pounds. This is because an 18-pound bird literally has to be stuffed into the unit and this can cause it to burn around the outside before the center gets completely cooked. A 12-pound turkey is much more manageable. If you want to be able to cook a large turkey, this is probably not the unit for you. At around $120USD, this unit is not all that less expensive than the Char-Broil Big Easy (around $160USD), which is propane powered, much larger, and more versatile. If you're looking for a good all-around outdoor cooking unit, the Char-Broil may be a better choice.